From our base in Bedford, Riverfield Office Interiors supplies commercial office furniture to businesses in London and across the South East of England. We design innovative and attractive space planning schemes for corporate offices and headquarters, reception areas, contact centres and high street premises. We can also save up to 50% of the cost of buying new by renovating your existing office chairs. 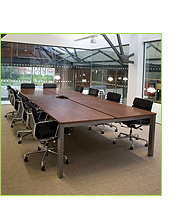 We provide a high quality range of contemporary office furniture, including office chairs, reception chairs, office desks, computer desks, workstations and boardroom tables. We can also provide specialist requirements such as ergonomic office furniture and executive leather chairs and seating. Our Smart Top Range of innovative, secure and flexible dual purpose computer desks and workstations is ideal for schools, colleges, universities, training centres and libraries keen to maximise their use of limited space. With over 15 years experience in the marketplace, Riverfield Office Interiors is dedicated to delivering high quality furniture at competitive prices, with free design and installation services, backed by the highest standards of customer service.